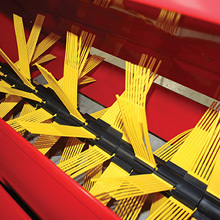 Most ‘ride-on mowers’ rely on air flow caused by the cutting blades to throw lawn clippings into the grass catcher. This system can be noisy and inefficient. Damp grass will often get clogged in the deck and discharge chute, requiring regular unblocking and an unacceptable finish on your lawn.